The surreptitious recordings, in which some officers were alleged to have made racist comments, could be made public soon after a yearslong battle. SOUTH BEND, Ind. 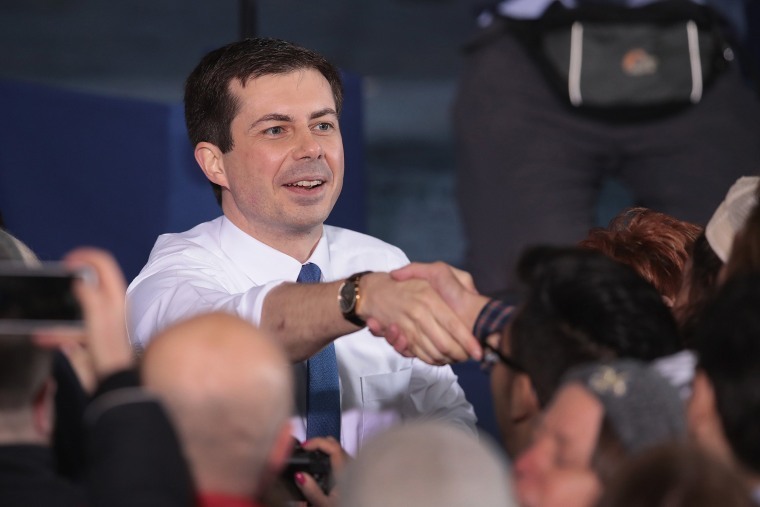 — A lawsuit related to the demotion of a former South Bend police chief could potentially re-open one of the more uncomfortable moments of Pete Buttigieg's mayoralty as his presidential run picks up steam. The controversy led Buttigieg to demote the city's first black police chief, Darryl Boykins, in 2012. Boykins then sued the city alleging racial discrimination, saying that the secret taping scandal was used as a pretext to oust him. Boykins' demotion prompted a wave of criticism from many leaders in the city’s black community. African American pastors and city council members have said they want the tapes released so they can hear whether white police officers used racist language. Separately, a group of officers is suing the city trying to block the tapes' release, saying they were illegally recorded. The mayor's office says it can't release the tapes without approval from a judge since the recordings could violate wiretapping laws. Nonetheless, Buttigieg said several years ago that he "would be very interested to know what is on the tapes." The department's former communications director said she discovered that the recordings contained racist remarks and even discussions of a potential criminal conspiracy and brought it to Boykins' attention. But Boykins and the communications director ended up being punished because the mayor's office said that the recordings violated laws that require at least one party to consent to being recorded on a phone call — a position strongly endorsed by the officers recorded on the calls. But the Common Council, which wants the tapes to be made public, claims there was "implied consent" among police officers because everyone knows the police department records calls. The mayor's office declined to comment on the pending litigation, and Buttigieg's campaign did not respond to a request for comment.